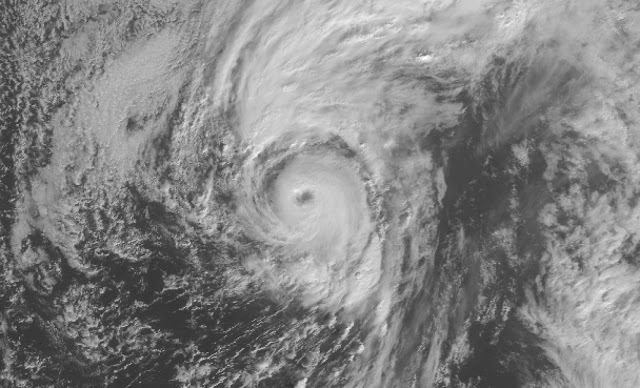 Alex is the first Atlantic hurricane to form in January since 1938. For the first time on record in January, the National Hurricane Center issued advisories for active tropical cyclones. Alex became the first named tropical weather system to form in the Atlantic during January since 1978. It was classified as a subtropical storm, one that exhibits a combination of tropical and non-tropical characteristics. 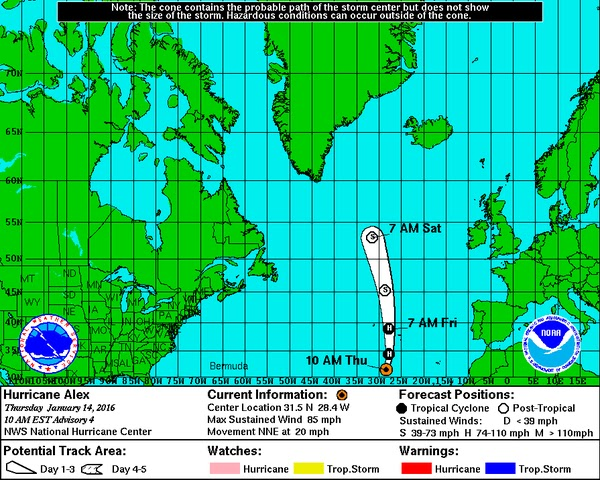 Alex became the first named Atlantic storm almost six months ahead of average, which is on July 9. In 2015, the first named storm, Ana, — which was also classified as subtropical — formed on May 7. Historically, only 0.5 percent of tropical storm activity has occurred prior to June 1. Alex has steadily strengthened over the past day and is making history as an extraordinarily rare January hurricane. The National Hurricane Center says Alex is the first Atlantic hurricane to form in January since 1938. The storm has peak winds of 85 mph, just about 5 mph shy of the 1938 January hurricane, the strongest on record for the month. Alex has strengthened over waters that are usually not warm enough to support hurricane activity. However, the contrast between the surface waters and unusually cold air at high altitudes has created a volatile corridor of air, fostering the storm’s development. “The resulting instability is likely the main factor contributing to the tropical transition and intensification of Alex,” the National Hurricane Center wrote in its 10 a.m. discussion. While Alex spun up in the Atlantic, another highly unusual tropical weather system for the time of year was setting milestones in the Pacific. A storm named Pali reached hurricane intensity in the central Pacific Ocean earlier this week, becoming the earliest hurricane to form in that region on record. Located just 4 degrees in latitude north of the equator, Pali also became the third strongest storm to occur so far south on record in the northwest Pacific basin and the strongest storm to occur so close to the equator in the western hemisphere. Pali’s strength and early formation were also supported by much-warmer-than-normal ocean waters in the Pacific, resulting from both this year’s strong El Nino event and ongoing climate warming.